Massage the scalp with warm organic coconut oil (heat it slightly in a double boiler or in a microwave for a few seconds), apply it on the hair and leave for at least 30-45 minutes. To increase the absorption of oil you can do a Saran wrap.Coconut oil is one of the best oils recommended for hair growth because it prevents the loss of protein from your hair. Moreover, it stimulates circulation, prevents dandruff, and reduces head lice infestation.You can follow hot oil deep conditioning treatments about once or twice in a week. If you want to soak your hair in oil for longer, then after applying the oil, wrap a soft towel around your hair, and leave it overnight. Boil some fresh curry leaves in coconut oil until the leaves turn black. Cool and strain the oil. Massage this oil generously onto your hair and scalp two times in a week to stimulate hair growth. Like curry leaves, you can boil dry amla pieces (Indian gooseberry) in coconut oil. Similarly, you can boil ten Chinese Hibiscus flowers in two cups of coconut oil until they become charred and use the resultant oil to augment hair growth. Massaging antioxidant rich, extra-virgin olive oil on the scalp aids in circulation, thereby encouraging hair growth. It stops DHT production on the scalp and hence prevents hair loss. In addition, olive oil works as a natural conditioner and scalp disinfectant. Another recipe with olive oil involves adding three drops each of cedar wood oil, thyme oil, two drops each of rosemary, lavender, peppermint essential oil, and half a teaspoon of grated ginger in a quarter cup of organic olive oil. Add organic honey and a teaspoon of cinnamon powder in warm olive oil. Massage this paste on your scalp, let it sit for 15 minutes and then wash it off. Apply castor oil or a combination of two tablespoons of castor oil mixed with four drops of rosemary essential oil to reduce hair loss. Being rich in fatty acids and vitamin E, pure argan oil works wonders in nourishing damaged hair, encouraging hair growth, taking care of curly hair, and protecting your tresses from ultraviolet rays and environmental pollution. Moroccan argan oil is quite popular in this regard. Emu oil promotes hair growth and fights baldness by revitalizing dormant hair follicles and inhibiting 5 alpha reductase.This enzyme that converts testosterone into DHT which, in turn, causes hair loss. Moreover, it has ant-inflammatory and anti-microbial properties. Eucalyptus oil stimulates blood flow and thus increases hair growth. Furthermore, it revitalizes dull hair, treats dandruff, improves hair texture, and promotes hair elasticity and luster. Amla oil serves as an excellent Ayurvedic remedy for reducing loss of hair. Sweet almond oil helps in reducing issues like hair loss, hair fall, and breakage; helps ease scalp irritation and inflammation, too. Grape seed oil is a light oil that nourishes the scalp and makes hair grow fast. It can be applied on all types of hair. In fact, it is helps make curly hair manageable. Jojoba oil is similar oil that absorbs quickly and does not make your hair too greasy after application. Pure jojoba oil is hypoallergenic. Wheat germ oil, rich in a variety of fatty acids (longer than the ones present in coconut oil), vitamin A, vitamin B complex, vitamin D, vitamin E, choline, and so on, is considered effective for growing long hair. You may use wheat germ oil in combination with coconut milk and aloe vera gel to nourish your hair and increase hair growth. 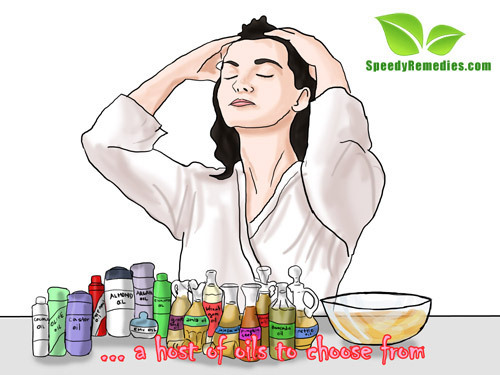 Another remedy involves massaging the scalp with two tablespoons of castor oil mixed with three drops of tea tree oil. Leave for at least half an hour and then shampoo. You can follow this treatment once daily. Avocado oil, being rich in amino acids and antioxidants, nourishes damaged hair and encourages healthy growth of hair. It is effective for deep conditioning. Flaxseed oil, being rich in essential fatty acids, stimulates hair and nail growth. Furthermore, you can make a flaxseed gel at home to manage curly hair. Pure nettle oil works as a hair tonic. Pumpkin seed oil inhibits DHT (Dihydrotestosterone) production, testosterone and androgen levels. Therefore, it assists in controlling hair loss. DHT blocks the hair follicles from absorbing proteins. Essential oils like that of rosemary, thyme, sage, lavender, cedarwood, peppermint, Roman chamomile, lemon, grapefruit, cypress, carrot root, geranium, ylang ylang, etc. can be mixed in carrier oil and massaged on the scalp to accelerate hair growth. Rosemary oil, in particular, is high beneficial for hair growth. In case you do not want to buy it, prepare the oil yourself by placing the herb in a glass bottle, adding oil of your choice (olive oil, avocado oil, jojoba oil, sesame oil, etc. ).Let this solution sit for two to four weeks. Apart from applying this herb externally, regularly drink two cups of rosemary tea. Apply a mixture of one teaspoon of vitamin E oil, two ounces of grape seed oil, six ounces of extra-virgin coconut oil, ten drops of rosemary oil, ten drops of eucalyptus oil and ten drops of tea tree oil. Add 3 ml jojoba oil, three drops each of lavender oil, rosemary oil, and two drops each of thyme and cedar wood oil in 20 ml grape seed oil. Massage with this oil and leave for at least 30 minutes. Mix a quarter cup each of jojoba oil, vitamin E oil, 15 drops of rosemary essential oil, and the same quantity of peppermint oil/eucalyptus oil. Massage your scalp with this oil blend daily before going to bed and leave it overnight.